Mark’s new book is published soon – it’s an expanded collection of his play scripts with extra commentary published this week. We will be getting stock in the next couple of days and be shipping them out at the end of the week. About a tenner, £7.99 plus postage – Enjoy! Funny, provocative and moving, The Liar’s Quartet includes the scripts with brand new commentary from Mark Thomas’ most acclaimed comic, political theatre. Layered with political insight (and insult), and peppered with anecdote, this is a bravura performance in its own right. Each multi-award winning show examines Thomas’ obsession with the bonds that bind us, those of family, friends and communities. Beginning with Bravo Figaro!, Mark puts on an opera in his dying father’s living room (with the help of Royal Opera House singers) to explore their relationship. In Cuckooed, he unpicks the betrayal of a friend and a fellow activist who was in fact employed to spy for the UK’s biggest arms company, BAE systems. And in The Red Shed, Mark returns to his political roots to harness the power of collective memory and celebrate the importance of working-class struggles and narratives in a story he describes as ‘a topical tale about the miners’ strike’. Laughter, anger and connection. 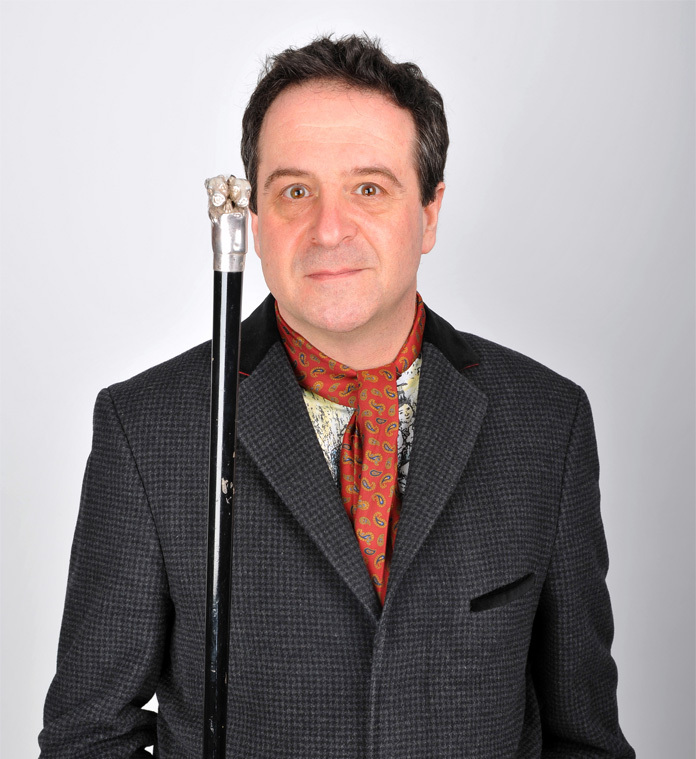 Mark Thomas is more essential than ever . . .
Mark doesn’t often make it to this part of the country so it will probably sell out very quickly! We’ve had a few requests to get the Daily Mail free zone stickers back in stock so here they are – stocks are limited so get them while they’re sticky! Few predicted the events of the past year. Mark sets out to find what the future has in store for us by asking the audience what their predictions for the future are, creating a fantastical, hilarious and sometimes accurate vision of the world. This show is all about gambling on the future. Based along the lines of his 2011 show ‘Manifesto’ Mark takes suggestions from the audience to create a snapshot of the future. The early “work in progress” version of the show is already booked in at the usual venues through July 2017 and all are already on the gigs page here. Just in – new tour dates for spring 2017 including a week at Battersea Arts and dates around the UK including Scotland, Salford, Sheffield, Newcastle, Taunton and many more – the full listing are found on the gig list. Plus we have stocks of the programme/script for Mark’s latest show, “The Red Shed” in Mark’s online store. In the store you will also find Domestic Extremist tea towels and aprons and now you can get a matching T-shirt from our friends at Philosophy Football. We have some more (about 100, be quick!) lovely vinyl “Mind the Farage” stickers back in stock ready for your wheelie bins or any other creative use you can come up with for them. £2 a pop or £5 for a pack of three. Come and get’em! As Farage “man of mystery” has stepped down (again) as UKIP party team captain but oddly hasn’t stepped down as an MEP even though he want’s nothing to do with Europe – maybe he needs the expenses, then he has more time on his hands, perhaps he could replace his second job with that of wheelie bin cleaner? Also, Mark’s new show “Red Shed” is at the Edinburgh Fringe soon and dates are currently going up for an extended nationwide tour in the Autumn. All dates should be up by the end of this week. To my Green Party friends: In the London Mayoral election your second preference counts. As a supporter of the Green Party and Sian Berry I will obviously be voting for Sian as my first preference on Thursday but the question of second preference has become incredibly important in the outcome of this election. I have publicly condemned New Labour for decades but I am voting Sadiq Khan as my second preference and I am asking my fellow Greens to do the same. The reason for this seeming turnaround is simple: we can not allow Zac Goldsmith’s campaign that has played with race and bigotry to win. Goldsmith’s campaigned has smeared Khan as linked with Muslim extremists and in doing so has not only pissed in the waters of public debate but has stoked fears and bigotry of the Muslim community. Goldsmith’s article in the Mail on Sunday , yet again pointing the finger and shouting friend of the jihadist, was accompanied by a picture of the blown up bus from the 7/7 bombings as if claiming Khan was somehow in league with terrorists! In Parliament Cameron claimed Khan to be linked to an Islamic State supporter Mr Gani, the fact that Gani turned out to be a Tory supporter shows Tory desperation but does not alter the focus of the race based smear campaign. And not forgetting Goldsmith’s leaflets cak handedly targeting the Indian community claiming Khan was against them. Time and time again Goldsmith dabbles with race and violence to paint Khan as ‘not like us’ , playing on prejudices about Muslims and fears of terrorism. London is the most diverse city in the UK and if Goldsmith wins he will have won on a racist campaign. We can not allow that to happen. If the Green Party does not stand for social justice alongside the environment then it stands for nothing. So I am asking friends and comrades to put Khan as their 2nd Preference. See you out there Thursday and good luck to Sian! Of all the campaigns and issues I have been involved with over the years the Western Sahara Campaign has been one that has always dogged my activist heart, hanging around, sometimes slipping from memory but always popping back unheeded to prod away at me. Western Sahara is one of the great forgotten causes of the world and for that fact alone it nips the heels of my conscience. Western Sahara was occupied by Morocco from 1975 and for a short while became a cause celebre amongst the left but faded from favour as the struggle wore on to a stalemate. There was a guerilla war to try to reclaim their land which was partially successful, Mauritania occupied the lower part of Western Sahara but were driven out – in part by Sahara fighters- only to be replaced by Morocco. Between 1975-1976 some 250,000 Sahrawis fled to the Algerian desert where they have been living in exile for over 40 years in refugee camps, there remains approximately 165,000 refugees still there. The more mathematical minded amongst you might well conclude that refugee camps should never be that old but they are. A while ago I visited the camps, towns really in the middle of the desert, made of tents for the winter and mud brick huts for the summer. As is often the case it is the poor who are most hospitable and the care and kindness refugees showed to me was quite overwhelming. So I am relieved to announce that this Monday’s show- Mayday- at the Tricycle is to be a benefit for the Western Sahara Campaign. The money will help the court case WSC are bringing, here are the details. Is Mark appearing near you soon? The Trespass tour continues through to the 7th May including Wednesday 16th at the Dukes, Lancaster and a few others – tickets are selling out quickly so make sure you don’t miss this show before Mark starts on a new show in June – details coming soon. Also new in the merchandise store we have DOMESTIC EXTREMIST Badges for when you feel silly wearing your DOMESTIC EXTREMIST apron whilst out and about. Thanks to Elliot Franks for the video.